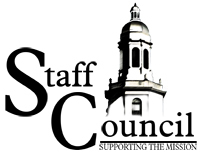 The purpose of Staff Council is to advance the exchange of information among the staff of Baylor by providing a forum for the expression of ideas and concerns of the staff of the university. Staff Council meets once a month during the school year. Who serves on Staff Council? The members of the Staff Council represent each division of the University and a variety of departments across campus. Membership into the Staff Council is determined by a nomination process. Any University staff person may self nominate or make a nomination of another staff member upon permission of that nominee. All nominees must have been employed by the University for a minimum of 2 years. The nomination process begins each February and is followed by an election each March. How is Staff Council involved? The Staff Council supports all Baylor staff by sharing information and gathering feedback on a variety of issues and concerns. The members of the Staff Council serve on various university committees to address staff ideas and university matters. They coordinate the sale of Baylor Spirit Shirts to continue promoting the tradition of Spirit Fridays and they also coordinate a fall and spring service project to benefit the local community. How do I stay informed as a staff member? The Staff Council website is a primary source for staff information at Baylor and a way for you to keep informed of current news and events important to Baylor University staff. Please drop by and visit us online at www.baylor.edu/staffcouncil.